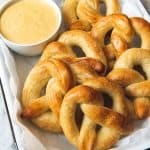 It's impossible to resist these Homemade Soft Pretzels with Mustard Cheese Dip! Salty, buttery and warm, soft pretzels are perfect for tailgating, celebrating Oktoberfest, or just for a fun afternoon snack! In the bowl of a stand mixer, combine the warm water, sugar and yeast, and let it proof for 5 minutes until foaming. Add the flour and salt and mix with a dough hook to combine, then knead for 5 minutes until the dough is smooth and soft. Cover bowl of dough with plastic wrap and let it rest for 30 minutes. While the dough rests, combine the boiling water and baking soda, stirring until the baking soda is dissolved. Preheat oven to 450 degrees F and line a baking sheet with parchment paper or a silicon baking mat. Divide the dough into eight equal pieces and roll each piece into a long rope, about 30" long. Twist into a pretzel shape by making an upside down "U" shape and crossing and twisting the ends, then folding them over to the top of the "U". Place the pretzels into the hot baking soda bath for 20-30 seconds, spooning the liquid over the pretzels, then transfer to the baking sheet and sprinkle with coarse kosher salt and bake for 10 minutes until golden brown. Remove the pretzels from the oven and immediately brush with the melted butter. Melt the butter in a medium saucepan or skillet over medium heat. Whisk the flour into the melted butter until lightly browned and thickened, about 2-3 minutes, to form a roux. Slowly add the milk to the roux, whisking constantly. Continue to whisk until the mixture thickens but is still pourable, about 5 minutes. Sprinkle the cheese over the sauce and whisk until it melts into the sauce, then taste and add the mustard, salt, and pepper to taste. Adapted from King Arthur Flour and Sally's Baking Addiction.